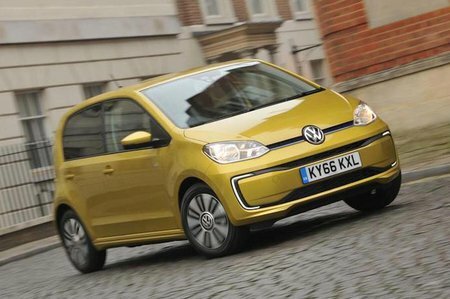 Volkswagen e-Up Performance, Engine, Ride, Handling | What Car? Making an electric version of an existing car can sometimes play havoc with weight balance and handling, but not with the e-Up. True, the addition of a big battery pack means it's around 200kg heavier than the petrol Up, but the instant availability of maximum torque (or pulling power) whenever you push the accelerator pedal actually makes the former feel nippier. It pulls away swiftly from junctions and traffic lights and is really easy to drive smoothly, because it builds speed predictably and there are no gears to worry about. Around town, the e-Up certainly feels a lot quicker than its official 0-62mph time of 12.4sec suggests, only running out of puff above about 45mph. Five regenerative braking modes help to recharge the battery when slowing down, and many will enjoy the default driving mode, in which the e-Up coasts freely (like a regular combustion-engined car) when you stop accelerating, rather than defaulting to heavy regenerative braking force like most electric cars. There are a few different driving modes to choose from: Normal, Eco and Eco Plus. Eco Plus slows the acceleration, lowers the top speed and concentrates the climate control on just the driver to try and help conserve energy. Eco does a similar job, but with a less noticeable impact on performance. The e-Up is actually good fun to drive through corners, thanks to accurate steering that gives reasonable feedback, although the standard energy-saving tyres aren’t the grippiest. Bumps are dealt with better than in many much more expensive cars, and even potholes don’t unsettle the Up too much, all of which makes it a comfortable car to scoot around town in. The e-Up’s range is rather less impressive. 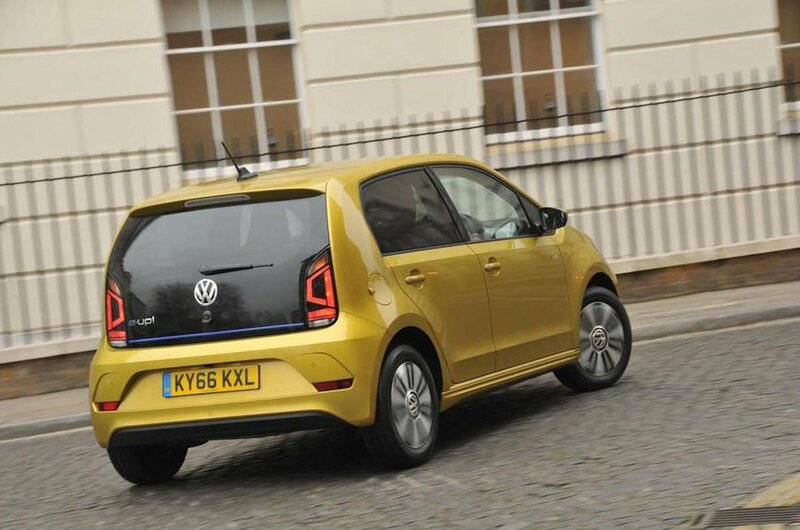 Volkswagen quotes 83 miles in optimum conditions, but it managed just 66 miles in our real-world testing. The Kona Electric, Zoe and Leaf all manage well over 100 miles. Only the Smart Fortwo EQ travels a shorter distance on a full charge, but then that costs a lot less than the e-Up.